Sosbee notes for the record that the State Bar of Texas intentionally misleads the public by indicating that this attorney is not eligible to practice law in Texas; no such limitation to practice law is written on the license issued by the Texas Supreme Court, except for the implied legal requirement that all Texas attorneys must satisfy the MCLE requirements. Sosbee is fully qualified and eligible to practice law immediately, without prior permission [from some of the tyrants who exercise unethical and perhaps illegal authority in some instances over the attorney], with the sole proviso that he notify the state bar and then insure compliance for the year. The State Bar of Texas in private acknowledges this fact; further, in the event that Sosbee does in fact decide at his sole discretion to resume the practice of law, he will make sure to satisfy the MCLE requirements for the year, and to notify the state bar. 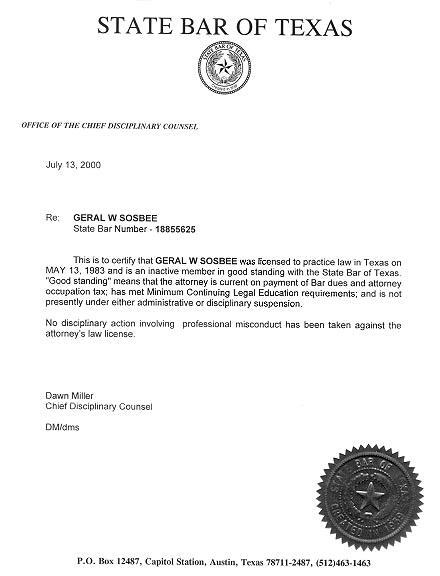 Also, Sosbee noticed in February, 2006, that the State Bar of Texas intentionally changed (on a date unknown) the color code of "attorney status" to the color red, from orange, thereby further falsely reflecting ineligibility to practice law in the State of Texas; this mean spirited tampering with the state bar web page for Geral W. Sosbee was done to mislead the public with regard to Sosbee's status. The state bar then again changed the color code to orange when he notified the state bar of the improper tampering, or hacking of the bar page regarding Sosbee. He also asked the President of the state bar to hold the officers of the State Bar of Texas responsible for such low tactics, or for incompetence. Finally, the officers of the State Bar of Texas owe a duty to its members, including Sosbee, to faithfully represent, free of corruptive influence, all attorneys in matters of public interest; this duty seems to have been repeatedly violated as briefly summarized above. Click Here To See More Information On The Decadent State Bar Of Texas.